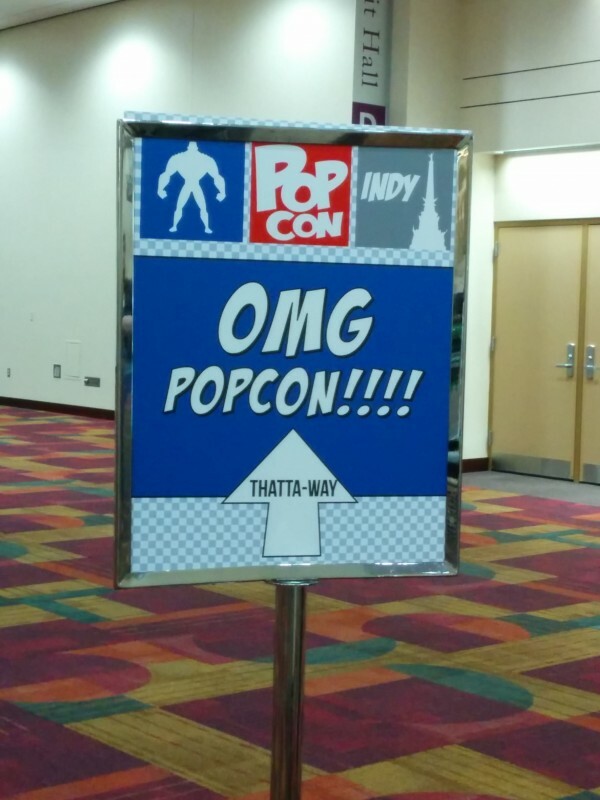 Indy Pop Con 2014: The Report! I spent this weekend at the first ever Indy Pop Con – and boy, was it a blast! Even with only going for two days, I still found lots to explore and had tons of fun! 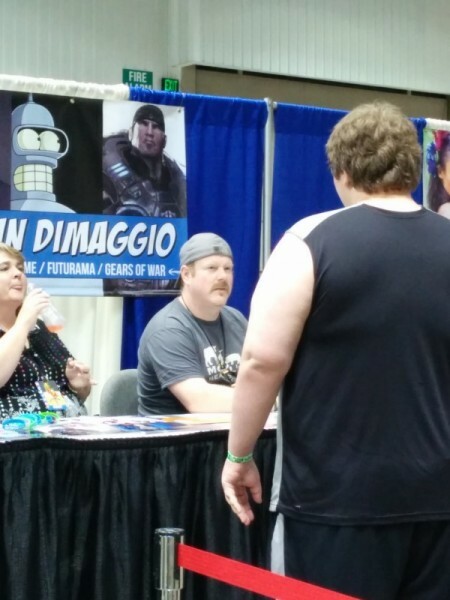 Now, you might recall my experience with Indiana Comic Con – disorganization, crammed halls, long lines, and way too many people showing up on Saturday for the convention to handle. Well, Pop Con was the opposite (except for the amount of people on Saturday – but I’ll elaborate on that later)! First off, picking up badges was a breeze – Ross and I had preregistered for the con, and went in with our “tickets” (a QR code printed onto a sheet of paper), which we exchanged for an actual, proper badge. There were different badges for the different types of guests: 3-day badge holders got sturdy cardstock badges, while guests of honor, vendors, VIP guests, and Kickstarter backers got nice plastic badges, all with different images on them. I loved how quickly we got in and out of line, and out to explore the convention! There’s a lot to cover about Pop Con, so take a look after the break and see the highlights of the convention! The exhibition hall was full of all sorts of goodies, and there was plenty of room to roam around without bumping into people – definitely not as packed as other conventions I’ve been to, but still busy. There were a wide variety of vendors, from comic books to vintage collectibles to anime booths to games, with a little something for everyone. The artists’ alley was the same, with art for just about everything popular you could think of. I think I spent most of my money on prints and posters in the artists’ alley. There were also quite a few cosplayers on Saturday – and Ross and I had planned on entering the cosplay contest, and even made it through the first round of pre-judging, but ended up exhausted way before the contest was to start. Pop Con definitely spoils its cosplayers, though – there was a dedicated cosplay lounge, walled off for privacy, where people in costume could go relax and take off parts of their costumes if needed for some quiet relaxation, as well as perform costume repairs in case of wardrobe malfunctions. I think that may have been my favorite part of the cosplay lounge, in fact. The lounge had a sewing machine and other sewing bits and pieces, extra makeup and paint, and all sorts of other bits and pieces to help fix up your costume if you had an issue. I’ve never seen anything like it before at any of the conventions I’ve been to, and I really hope they keep this up for next year! Back to how efficient things were at the con! The professional photo ops were done with a ticket system – you could buy tickets ahead of time, and then show up at a specific time to get your picture taken with the star of your choice. For both photo ops, Ross and I were in and out of there in minutes flat. 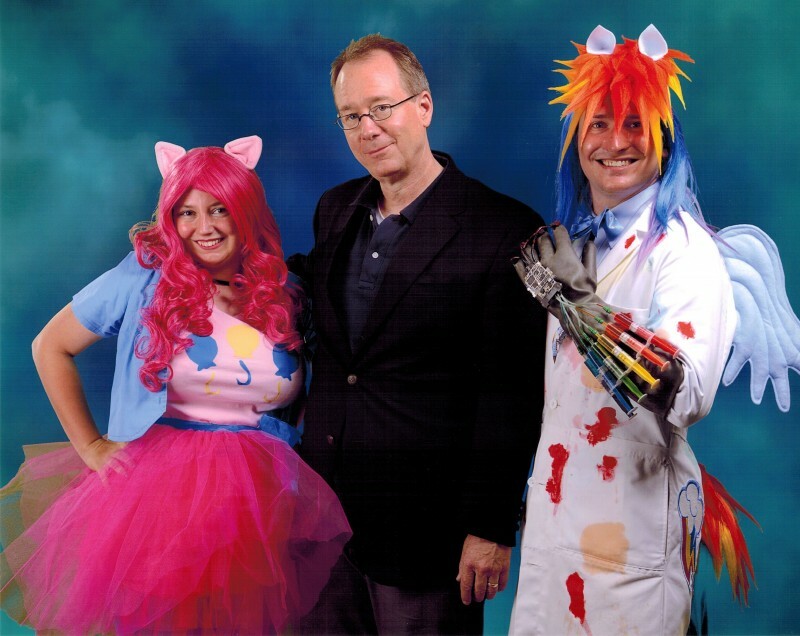 And there we are with Joel of Mystery Science Theater 3000 fame! Ross was really excited to meet Joel, haha. And there were many other stars there, including…. 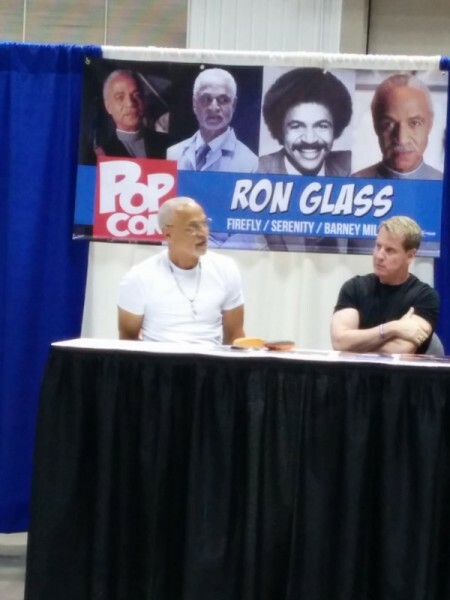 Ron Glass, who I was much too shy to go up and ask for a photo with him. Kristian Nairn, who is incredibly tall and even signed his autograph as Hodor! 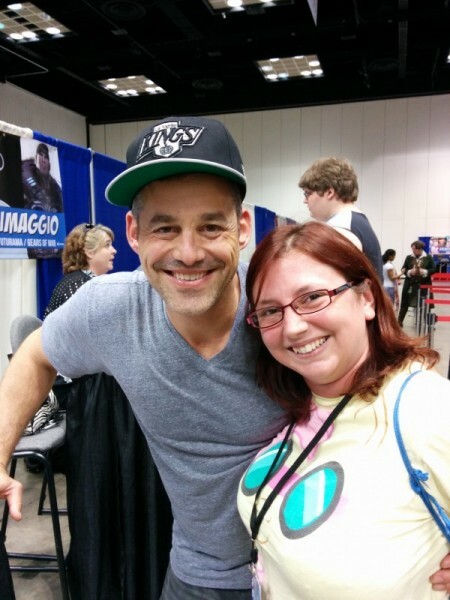 Nicholas Brendon, who really likes to give hugs! I may have flailed after this one and said “OMG I HUGGED XANDER”, haha. 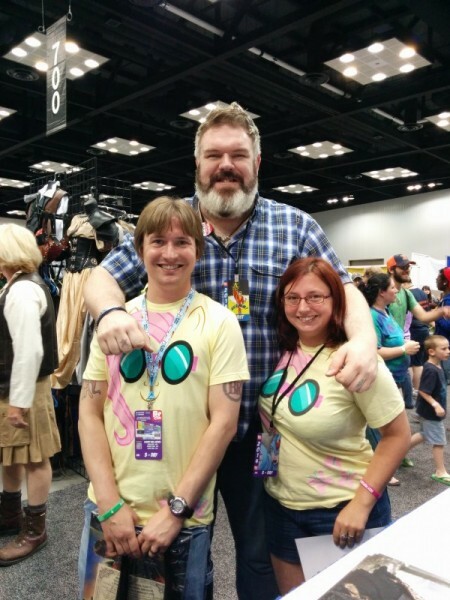 It was especially awesome to get to meet Kristian Nairn and Nicholas Brendon – I discovered that Kristian is not, in fact, a brony, despite the internet thinking so because he was seen wearing a My Little Pony shirt. (The story behind that: He saw a bunch of shirts on Redbubble that he liked, and bought them – and two of them just happened to be My Little Pony shirts.) Nicholas (or Nicky as he referred to himself during his Q&A, haha) was super friendly and approachable, and I got not one but two hugs from him. His Q&A was a lot of fun too – and I’ll be dedicating an entire post to that in the coming days.